Good morning! How are you today my little chickadees? I hope Monday didn't pose any problems! I had some quality sewing (and unsewing) time yesterday. Super sewing day with NCIS: LA on all day! I love tv and I don't care who knows it! Just about done with my little bag. The strap is too long so I need to shorten it and then I can throw all my stuff in it and call it good! I need to make some adjustments on the next one, make the flap just a smidge narrower, the rick rack took up the space that makes it flip right past the D rings. I also need to somehow make the sew in magnet (that's inside between the lining and outer bag) more effective. The magnet isn't strong enough to hold the flap down. Oh details! I guess they're weak enough not to demagnetize our credit cards but not strong enough to hold our bags shut. 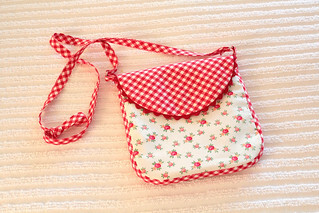 But, I think it's pretty cute because I love scallops and gingham and well sewing and playing around.. you know. If I never use it and just hang it off a doorknob I'll be happy. I am plenty of cute things hanging from hooks and knobs! !and this is adorable Pam? Have a great day. Super cute! The strap can sometimes be the trickiest part of the bag. Getting it just right. I usually have to make mine longer than the pattern instructs. Have a fantastic Tuesday! Love it! And those scallops are too cute. It's so darn cute, love it! Well this is just too stinkin cute! It would be cute on a doorknob but perfect for using! Adorable! 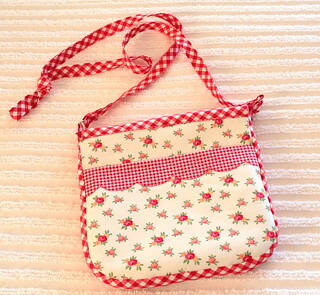 What a cute little bag and how lovely to see someone calling others Chickadee, my Grandad used to call me that. Very sweet. A perfect little pouch to carry essentials! Adorable Pam! Holy Moley. That could not be any cuter. love it.